The first time I ever fished the San Joaquin River was in its pristine Middle Fork, high in the Sierra Nevada in the Devils Postpile National Monument, when I was 10-years-old. While hiking with my aunt Alicerae, I pulled my first-ever golden trout out of a deep, crystalline pool below a big cascade. Since then I have fished the river many times for striped bass in the wide and lazy lower San Joaquin where it winds its way through the Delta. However, I had never fished out of Pirates’ Lair, located on the Mokelumne River at its junction with the San Joaquin, where Captain James Netzel of Tight Lines Guide Service berths his boat when he is striped bass fishing in the fall and spring, before I fished with him on April 25. The name Pirates’ Lair first conjured up in my mind a secret refuge for privateers to store their gold doubloons and other loot. The reality is considerably different, but fascinating. The land where Korth’s Pirates’ Lair now sits was purchased in 1931 by Albine and Josephine Korth, with the hope of using the 47-acre parcel as an asparagus farm, according to the Pirate’s Lair Marina website. In the spring of 1932, Albine moved two bales of hay along with his two horses to his new farm. The hay was promptly stolen. And so, it was that the name of the place was born, now a thriving resort offering marina facilities, a restaurant, a mobile home park, a launch ramp, a gas dock and a gift shop. We started off fishing Santa Clara Shoals with deep-diving Yo-Zuri Crystal Minnows at 14 to 16 feet deep on the outgoing tide. The long-time angler caught the first keeper of the day and I followed up with two keepers in the 19-inch range. We kept one and released the others, as well as releasing three shakers. 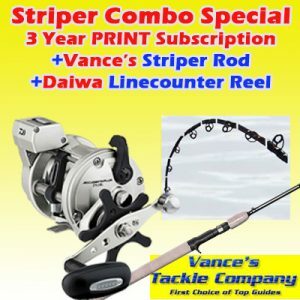 Every time we put our lines out, Netzel told us amount of line each of us should release from our reels, an easy task, since we were using Cousins rods outfitted with Shimano Tekota Line Counter reels. The tepid bite slowed down and we then went to Light 38, where we hooked a couple of shakers. Netzel next drove his boat at the start of the incoming tide to the mouth of Old River, where we finally found a school of fish that wanted to bite after we switched to shallow running Yo-Zuri lures. We hooked one fish after another, including some in the four to five-pound class, along with some shakers. The hot bite ended as fast as it started. We did pick up a few more fish, including a 6 pounder that provided me with an excellent battle. We ended up bagging limits of stripers, as well as releasing a bunch of keepers and shakers. Our largest fish weighed 6 pounds, but Netzel noted that a previous trip produced a larger class of fish. Netzel said the fish he has caught this season have averaged 3 to 4 pounds, with the biggest (released) weighing 15 pounds. He plans to fish for stripers until mid-May and then will troll for a week for trout at Folsom Lake before going up to Stampede to target kokanee salmon. When trolling the deep diving Yo-Zuris, Netzel trolls at 2.6 mph with the current and 4.2 mph against the current. When trolling shallow-diving Yo-Zuris, he trolls as fast as he can, up to 6 mph. 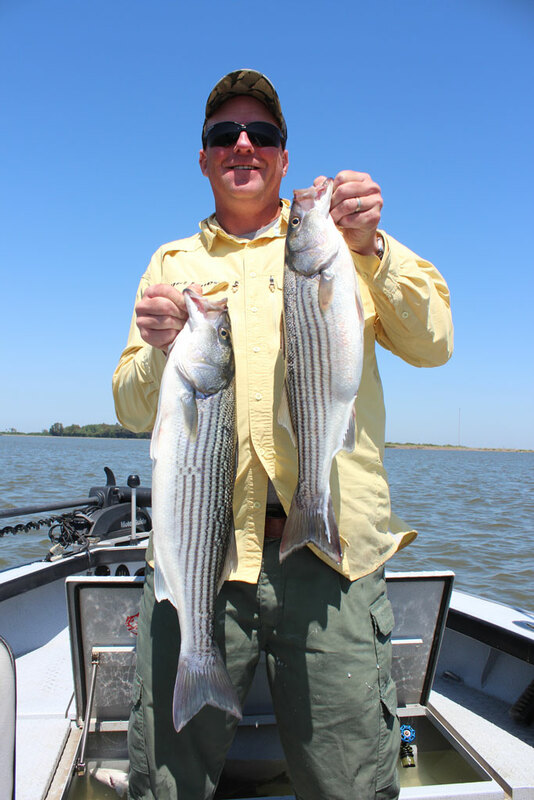 Before the striper fishing slows down, Netzel forecasts some of the best fishing of the spring on the San Joaquin and Sacramento. “Earlier we were catching only males with the occasional big female, but now we are catching a mixture of both, with quite a few opportunities of 10 plus pounders daily,” Netzel pointed out. 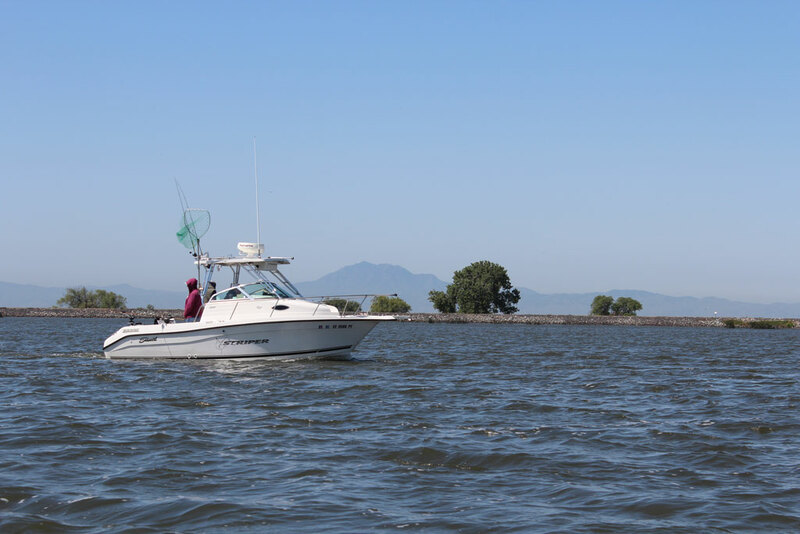 “While we are currently trolling mainly on the San Joaquin side of the Delta, we are getting ready to switch over to the Sacramento side and drift with live bait. With the continuing strong bite occurring up in the upper stretches of the Sacramento and Feather rivers, fishing pressure down here greatly decreases and makes for less crowded fishing opportunities,” he explained. Striped bass, an introduced species, are now one of the most popular fish species for anglers to target in California. The initial introduction from the East Coast took place in 1879, when 132 small bass were brought successfully to California by rail from the Navesink River in New Jersey and released near Martinez. The newly-founded Fish and Game Commission made a second introduction of about 300 stripers in lower Suisun Bay in 1882. Abundance probably reached a peak of 3 to 4.5 million fish in the early 1960s, due to several years of good habitat conditions for young bass in the late 1950’s. From the mid-1960’s through 1976, the adult population varied from 1.5 to 1.9 million fish, but declined to as little as 600,000 in the early 1990s, according to the California Department of Fish and Wildlife (CDFW). Although many factors played a role in the striped bass’s decline, increases in federal and state water exports are regarded as the main factor. The population rose again to 1.3 million in 1998 after the institution of the Fishery Foundation of California’s striped bass pen-rearing program. 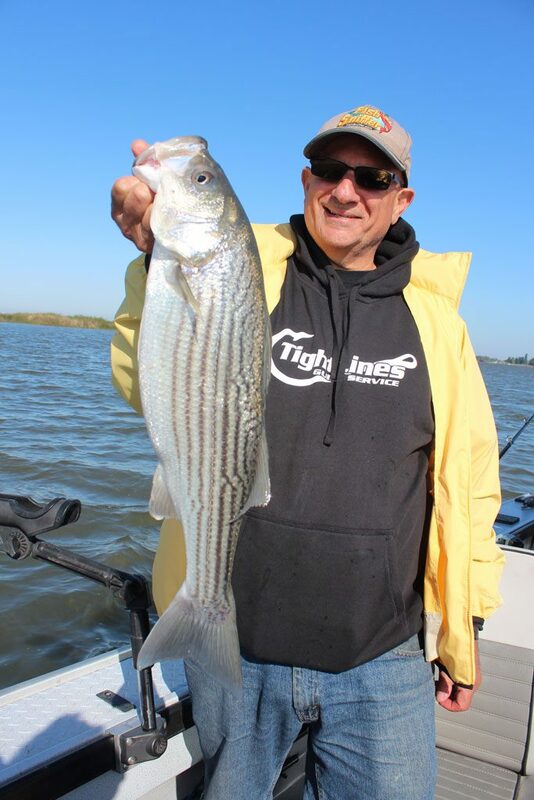 The population again declined in recent years, but the good numbers of legal-sized stripers showing in the catches in the Sacramento and San Joaquin Rivers and Bay Delta over the past couple of years point to an upswing in the adult striped bass population. “The rigor of estimates has also suffered some due to the relative scarcity of females and older fish, which would require a large amount of additional field work to address. That said, we are tagging now, still paying close attention, and still get good information on harvest rate, recruitment, and relative abundance,” he concluded. 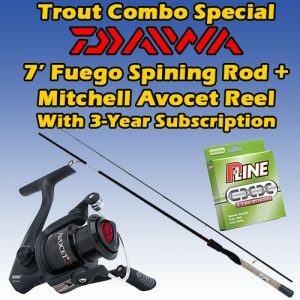 For more information, call James Netzel of Tight Lines Guide Service at 888-975-0990 or go to http://fishtightlines.com. Location: The San Joaquin and Sacramento rivers in the Rio Vista region are the two top rivers for striped bass in California. They also support good populations of sturgeon, catfish, king salmon and smallmouth and largemouth bass. Boat ramps: Boat launching is available at the Brannan Island State Recreation Area, Sandy Beach Park Launching Facility in Rio Vista, the Delta Marina Launch Ramp, City of Rio Vista Launch Ramp, Vieira’s Resort, and Isleton Launch Ramp (next to Ramos Oil Company). 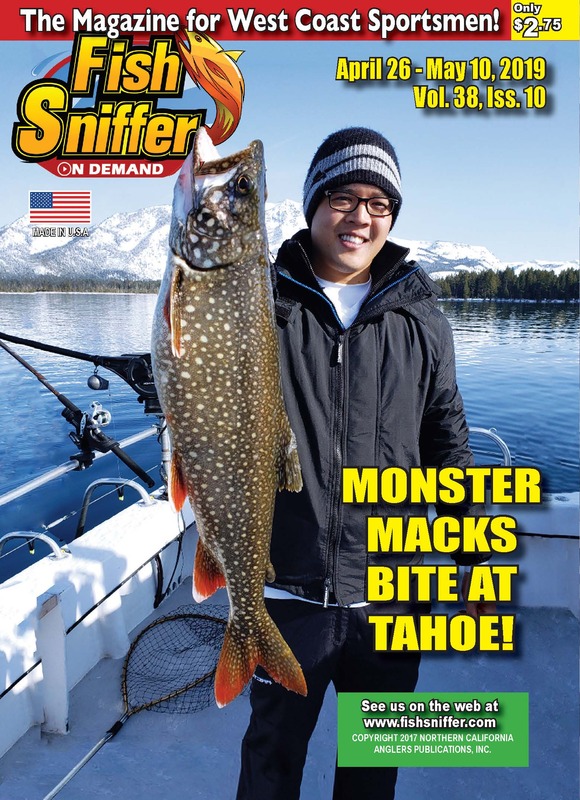 • Steve Mitchell, Hook’d Up Sportfishing, 707-655-6736.